In the Spring of 1277, Prioress Eleanor goes on a pilgrimage to a famous East Anglian shrine. There are rumors that King Edward may also visit the shrine soon to seek God's blessing for his invasion of Wales. Lurking in this sacred place, however, is an assassin hoping to murder a king. Soon after Prioress Eleanor and Brother Thomas arrive, a nun falls to her death from the priory bell tower. Brother Thomas finds the body, and the pair realize that this nun's death was not a simple tragedy. The circumstances point to murder, but this slaying is further tainted with treason. Among the pilgrims, merchants, and religious, too many betray an interest in this death—including a canny street child. At least one of them is most certainly a killer. Can Prioress Eleanor and Brother Thomas succeed in exposing the assassin or will they also fall victim to one who has made a covenant with hell? 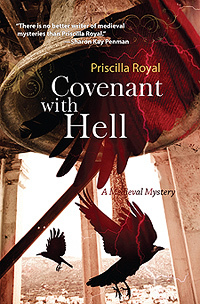 "There is no better writer of medieval mysteries than Priscilla Royal." "Royal again demonstrates why she's a worthy successor to Ellis Peters." "...this one pulls in enough red herrings to keep even non-medievalists interested." "Royal does her usual superb job of dovetailing both the religious and the political subtext bolstering her tautly strung narrative. This historically authentic series is definitely on a par with the best of Peter Tremayne and Ellis Peters."